I wish God was alive to see this. 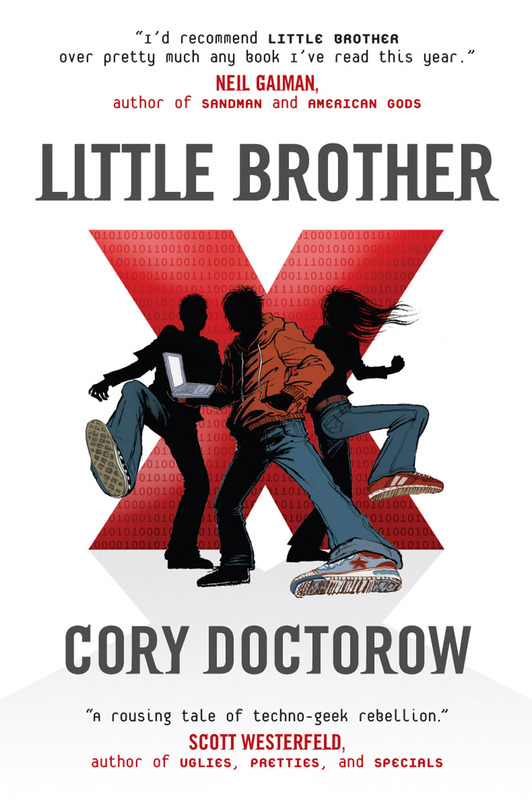 Little Brother tells the story of Marcus Yallow and his group of friends, high school students in a near future San Francisco. At the start of the book they are depicted as rebellious, tech savvie kids who spend their days engaged in light rebellion against the invasive security practices of their high school. While playing truant from the school to take part in an augmented reality game, they are caught up in a terrorist attack on the city and, due to their suspicious behaviour in having bypassed high tech security measures to get to the site of the attack, they are detained as prisoners of war by the Department of Homeland Security. The main focus of the book is Marcus’ reaction to his unlawful arrest and release on the background of ever tightening security on the streets of San Francisco. He becomes the de facto head of a teen revolution against the grip of Homeland Security, ultimately being again arrested and tortured by his own government. The book is fast paced and is an easy read, partly because of the pacing and partly because of its intended target audience being teenagers. The author goes into a great deal of detail in describing the various ways that Marcus learns to beat the ever more sophisticated forms of electronic surveillance that the government deploys in the name of protecting the freedom of its people, and the author’s notes states that these are all real, effective methods of defeating electronic surveillance in the real world. This was one of the most fascinating aspects for me, and raises a lot of questions about how much we are monitored. After reading, I couldn’t stop myself counting how many times my image was captured on security camera in an average day. The author’s enthusiasm for his subject material is one of the books biggest strengths, but also contributes to one of its weaknesses also. This is essentially an evangelical text on the evils of electronic surveillance and the ensuing invasion of privacy. As such, the characters on the side of the government are portrayed as caricatures – the part of the DHS forces could easily be played by Darth Vader and his stormtroopers for all the balance that is on display here. Despite this, I found the book hugely entertaining, and, although the point is laboured, it does raise significant points about privacy, especially as pertaining to high school age children. I intend to give this to my daughter to read once she hits about 12. One further point, the author also has a very healthy disregard for copyright laws, and the book is available as a legal, free download from his own website – I read it in PDF on my work Desktop. All his other books are also available from this source. 8 out of 10 encrypted flash drives. Get it here. Legal Free Book.